We don't travel far distances or take vacations. Weekend getaways are out of the question too. However, every so often, Lisa and I discuss how fun it would be to take the kids on an overnight trip. Preferably by a body of water. A dog friendly sandy beach. 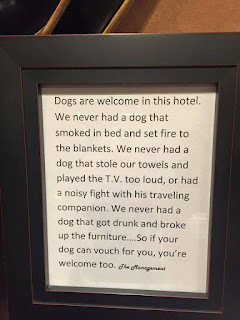 And, the most obvious, finding a pet friendly hotel. While we both know there's a 99% chance this will never happen, I occasionally like to amuse myself. What. If. For shits and giggles I did a little research on pet friendly hotels. Finding a dog friendly hotel was easy. There are quite a few. Pet friendly does not translate to red carpet treatment for the fur-kids. That was the case with the few hotels I did call to inquire about the fine print. Although the fine print varied slightly between the three hotels, the rules and regulations were almost identical across the board. 1. There are fees. To be expected. One of the hotels charged a small, non-refundable fee and an additional security deposit. The other two hotels only required an additional security deposit. The extra security deposit was required just in case there was minor damage or "accidents" caused by the fur-kids. Obviously. That's what security deposits are for. I asked if there was a separate security deposit required for parents checking in with young human children. After all, there's a better chance of a human child spilling grape juice on the carpet or peeing in the bed. The human on the other end of the call was not amused. 2. Signature required. All 3 hotels had a printed pet policy. Upon checking in, pet parents have to read and sign this policy. I had to ask. Was there a policy for parents of human children to sign? Again...not amused. 3. Size matters. So does the breed. One of the hotels made it quite clear dogs over 50 pounds were not allowed. The other two were kind of sketchy and stated, "We don't usually allow large dogs here. We have on occasion, but..." When I asked about breed restrictions, they listed most of the ones typically blacklisted by insurance companies. I had a field day with that one. 4. There is a limit. You can check in with 5 human kids. However, if your kids have fur and poop outside, one is the limit. Or two. Three? Nope. 5. The bed and furniture are off limits. This was a rule at two of the hotels. If a human chooses to sit on a chair or sofa naked, sweaty bum crack and all, or "have a quickie" on the bedspread, no problem. However, if your fur-kid wants to curl up with you while you're stretched out watching a movie or pounding away on the laptop, forget it. Not allowed. 6. Keep the noise level down. This translates to minimal barking, please. Excessive barking will not be tolerated and, if it disturbs other guests, you can be asked to leave. I understand this. I get it. Respect thy neighbors. The big question I had was, "Does this apply to humans as well?" Are parents told that if their human kids are allowed to run around and scream and disturb other guests, they could be asked to leave too? This was just the tip of the iceberg of the rules and regulations. And, let's not forget, the printed "pet policy" that had to be read and signed upon checking into your room. After my phone call to each hotel, I wasn't left with a warm fuzzy feeling. I didn't get the impression that any of the three hotels welcomed pets with open arms. It leaned more towards, "You can bring your pet, but...."
My efforts in finding a pet friendly hotel wasn't a complete waste. I learned quite a bit. The term "pet friendly" reels pet parents in. However, keep in mind that, with some hotels, pet friendly can boil down to "we tolerate pets." It's probably fair to say some hotels load on extra fees and enforce a lengthy list of rules to deter the fur-kids from accompanying their humans. As for the dozens of hotels I didn't call, maybe their policies were more lenient. There could be hotels out there with designated doggy areas or ones that offer concierge services such as pet-sitting or walking. Or, some that go the extra mile and leave a dog biscuit on the pillow. I know quite a few dog parents who go on vacations with their fur-kids and they have nothing but good things to say about where they stay. I noticed too that a handful of Bed & Breakfast places were pet friendly. The biggest thing to remember, when making reservations at a pet friendly hotel, is to ask questions. Inquire about the fine print. Have them email you a copy of their pet policy. Don't assume you can show up and check-in with your 5 gorgeous German Shepherds just because the hotel claims to be pet friendly. On a side note, do a little research about nearby attractions, beaches and everything between. Your pet friendly hotel of choice might be located amid a not-so-pet-friendly area. Do you vacation with your fur-kids at pet friendly hotels? If you've got some tips and advice or recommendations, we're listening!